I had a meeting at Wisley this morning so decided to get there a little early so that I was able to have a quick walk round. 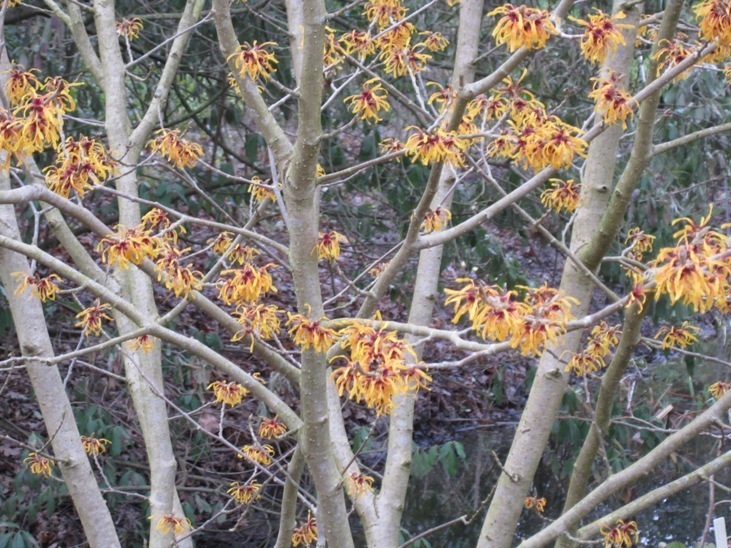 What stood out amongst the crowd was the witch hazel (hamamelis) which has just started to come into flower. Witch hazels have a tree-like habit and produce spider-like yellow, gold, orange, spice-brown or warm-red flowers on bare branches. Not only do they brighten up the garden at the bleakest time of the year, amazingly, they have a warm oriental fragrance and the Autumnal foliage is warm and vibrant too. Some witch hazels are more fragrant that others, the strongest, sweetest fragrance belonging to Hamamelis x intermedia ‘Pallida’, a sulphur-yellow variety which smells strongly of freesias – intoxicating! Hamamelis x intermedia ‘Aurora’ is another freesia-scented variety, in fact one of the best witch hazel varieties there is, which has very large, peachy-orange flowers. 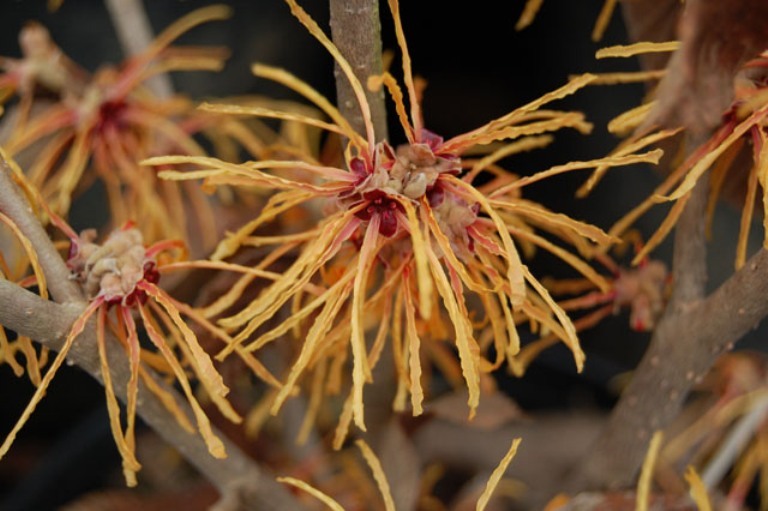 Many gardeners are reluctant to try witch hazels because compared to other shrubs they can be fairly costly, but they should grow well as long as they are planted in humus-rich soil, with a PH of between 4.5 and 6.5. When planting witch hazel, try to leave plenty of space around it. This not only looks better but also enables the summer sun to reach the wood more easily so that it can produce more flower buds. 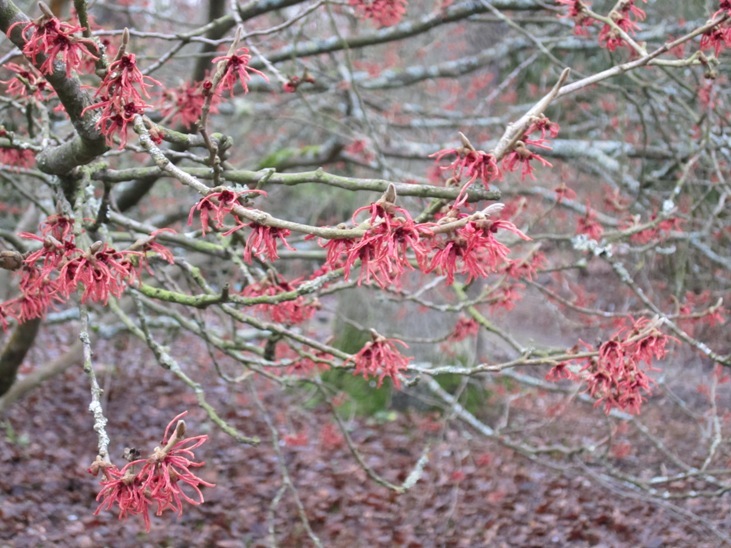 Witch hazels planted in deep shade will not flower so well, if at all, and sometimes a dull summer will affect the number of flowers produced the following winter. Conversely a bright warm summer will ensure an abundance of flowers and magnificent display some 6 months later – simply gorgeous! I had no idea they had such beautiful colours. Lets hope spring is on the way! Gorgeous aren’t they! And the great thing is that they inject a bit of colour and scent into the garden when not much else is in flower.